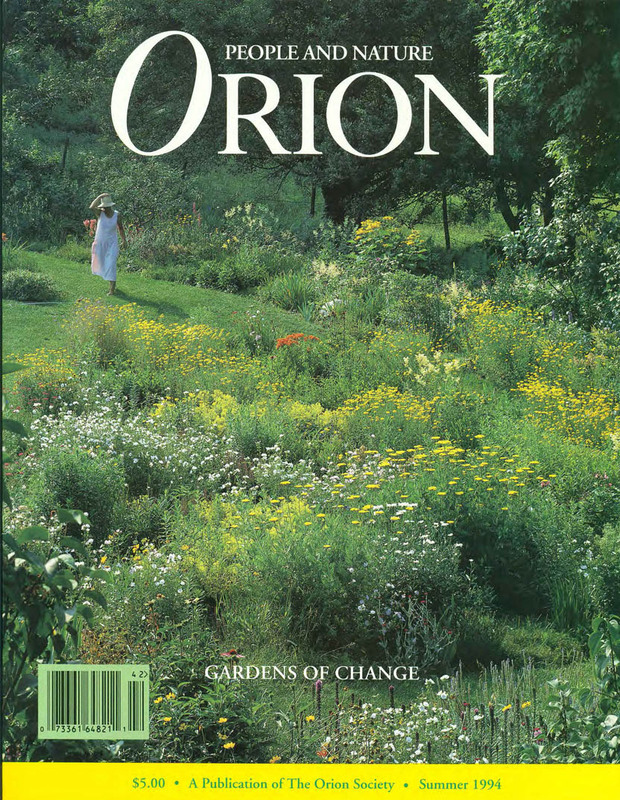 “Gardening and Being” published by Orion 19 years ago. 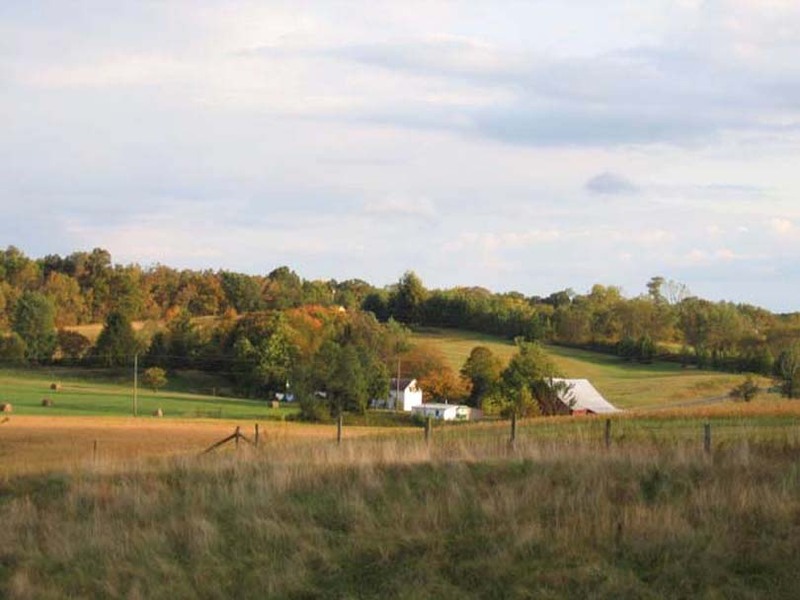 Looking south to a neighbor’s place from our former farm in southern Ohio. 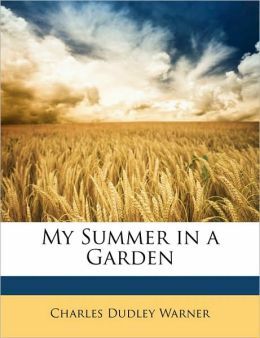 I used his words as a springboard into an essay, “Gardening and Being,” for the summer 1994 issue of Orion. I explained how gardening had grounded me as a person, how its lessons and discipline had been my true crop. The short piece, 1,079 words, was my first personal essay in a slick national magazine. It also marked the seventh anniversary of my and my wife’s purchase of a featureless rectangle of land, an Indiana soybean field, that we’d transformed. By then our white faux colonial farmhouse overlooked our pond, a shimmering blue acre of water, and was embraced by greenery—hundreds of trees and shrubs, gardens of vegetables, perennial flowers. As if endorsing our efforts, the city had built a state-of-the-art elementary on our road, just in time for our daughter and son to start school. There was not a tree or a welcome blade of grass on the place. Our plot was similar to countless raw tracts in suburbs across America. That first spring our infant daughter accompanied us in a blue backpack as we slowly planted rows of pines; our Labrador retriever bounded across the tender ground following country smells. Those trees barely show up in the earliest photographs of our land. The red pines were about a foot tall, and the Virginia pines were barely six inches. For the gardening column I was writing for our local newspaper, I’d just taken a picture of that daughter, Claire—“a big second grader,” as she crowed—standing beside those pines, which towered over her, some of them fourteen feet tall. We’d buried our Labrador, Tess, beside the pond she’d loved. A writer in my Sunday school class, Scott Russell Sanders, admired my column and put me in touch with Orion, which was looking for short essays for its “Editorial” feature at the front of the book. I wrote a new version, and a gifted young Orion editor, Emily Hiestand, now a successful author and photographer, whipped my prose into shape. I’d never experienced such microscopic editorial attention. Warner’s book has been reprinted. 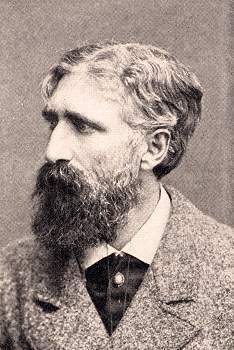 Remembering where I found Charles Dudley Warner, however, hovers now almost out of reach. I probably learned of him from Michael Pollan, who quotes Warner briefly in his first book, Second Nature: A Gardener’s Education, which I’d reviewed. Guessing that provenance helps retrieve who I was when I quoted Warner almost two decades ago: a guy from a Florida beach town trying like mad to orient himself in a foreign land, Indiana, where even the maples at first seemed exotic. Certainly I recall the timeline that followed that essay. Two years after its publication, we sold our dream place, created with such effort and joy, and started over in Ohio. We left for career reasons, though I see now that we were unaccountably restless too. In Ohio we got more land, and I got ambitious about agriculture. I was chasing my boyhood fantasies, kindled in the wake of my father’s loss of a farm. My becoming a “real farmer,” like Dad, almost derailed me as a writer and wrecked me physically. But it was an adventure I cannot regret. As chronicled in my forthcoming Shepherd: A Memoir, a lifelong dreamer had acted at last, made peace with his father, and learned who he was. When I remembered the Orion essay recently, I had to order a copy of the issue; my files, having been moved repeatedly since it appeared, are a wreck. I’m still a gardener, so not quite post-agrarian, but currently live in town. Reading it after so many years, I’m startled by how much Warner was speaking to me. No mere bit player for my essay, he was my very muse—but I couldn’t yet hear him. If I had, I’d have stayed put, stayed small, and hoed my Hoosier plot. All the same, his soulful inquiry was indeed my topic; it’s just that I wasn’t finished with it, or it with me. My little essay, I see now, wasn’t a final word but a first step. In order to enjoy agriculture, you do not want too much of it, and you want to be poor enough to have a little inducement to work moderately yourself. Hoe while it is spring, and enjoy the best anticipations. As it turned out, my first lambing—indeed, that entire growing season—was a disaster of biblical proportions: genetic defects, heat, locusts, storm, and drought. And soon a vile disease would emerge among the sheep, I’d get seriously hurt trying to save a dying ewe, and we’d have to sell some magically beautiful land. It is not much matter if things do not turn out well. —because for us they did, in the end. 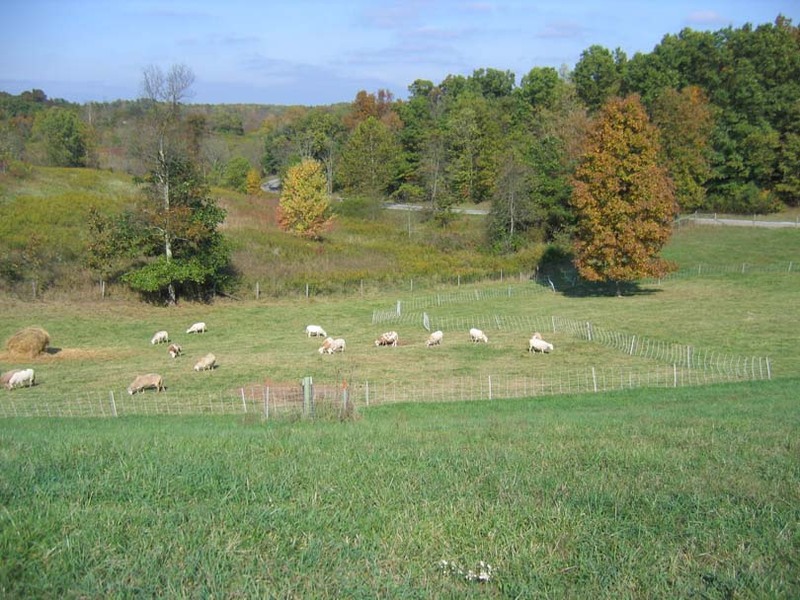 Sheep grazing our northern pasture, a neighbor’s wild fields beyond: my favorite view. And those early seeds sprouted into dreams fulfilled, reconciliation, integration of identity, a book. Lovely piece, Richard. You got it. Thanks, Beth. I enjoyed Warner’s words and yours. It’s interesting to pick up a piece of writing from years ago, to look at what we understood and didn’t. So looking forward to reading this memoir of yours, Gilbert, and I’ll be especially interested in how you deal with all the setbacks you endured, how you observe it all from your current vantage point. People have encouraged me to write a memoir of our current land fiasco here in Costa Rica. I do journal it, but I don’t think I have the perspective to do it justice (as memoir) just yet. We are, after all, still mired in the seemingly endless legal morass. It takes a while, I think, to separate yourself and look back at what was lost and what was gained. I always enjoy reading your blog. Thank you, Sarah. Yes, perspective is what you need, I agree. When I started writing my book we were still on the farm but many years and a lifetime or two removed from our tumultuous early years. Journaling and even blogging, though, is beneficial while in the midst of it, if only for your sanity. Hi, Richard. I think sometimes that trying to grow something against all the odds is really trying to grow one’s own green thumb. My father had no problems with his ambitious vegetable garden, but every year, he also grew his real love, roses, roses of every hue and shape, and kept at it in spite of the fact that whatever poisonous or new-fangled or ingenious thing he put on them, the Japanese beetles always ate at least half his crop. You have to feel the love to do a thing like that, and I think if he were still alive to tell about it, you and he would have a lot to discuss! Oh yes, Victoria. Gardeners always have a lot to talk about! For instance, that the Japanese beetles seem not so bad of late. Richard, you were a miracle worker with that soybean field–it was a beautiful labor of love. I can still see it in my mind’s eye. Thanks so much, Dave. Great to hear from you—and a witness! I don’t think our Bloomington friends knew we did everything on that place; we were crazy—well, I was—even then. Richard, your work was shockingly masterful. Even then. So you lived in Indiana too. And went to Sunday School with Scott Russell Sanders! Nothing was wasted in all these travels. And the seeds you planted long ago have grown into a lovely hardy maple, the tree of art. Yep, no regrets, Shirley. And those trees are huge. Mostly oaks, honey locust, and pines—the first two are my favorite trees, and as a southerner I have to plant pines! Ancient stories . . .